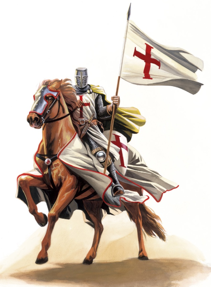 "Knight Templar" Fulk (1090 � 1143), also seen written as Foulques V le Jeune, is the 16th great grandfather of Sir Edward Southworth, the first husband of Alice Carpenter, my 7th great grandmother. He also is known as Fulk the Younger. Southworth is the 14th great grandnephew of Count of Nantes, Geoffrey, who is the 7th great grandson of English King Alfred the Great. 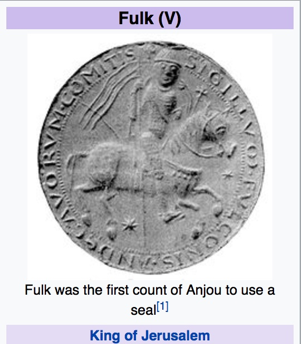 He was the Count of Anjou (as Fulk V) from 1109 to 1129 and the King of Jerusalem from 1131 to his death in 1143 in a hunting accident, falling from his horse. 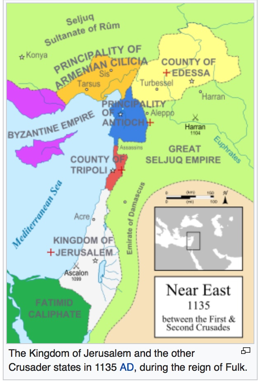 During his reign, the Kingdom of Jerusalem reached its largest territorial extent. Fulk was born at Angers, France, between 1089 and 1092, the son of Count Fulk IV of Anjou and Bertrade de Montfort. In 1092, Bertrade deserted her husband and bigamously married King Philip I of France. According to William, Fulk was "a ruddy man, like David... faithful and gentle, affable and kind... an experienced warrior full of patience and wisdom in military affairs." (an obvious nomenclature of the Bible�s King David). His chief fault was an inability to remember names and faces. Much later, Henry arranged for his daughter Matilda to marry Fulk's son Geoffrey of Anjou, which she did in 1127 or 1128. Melisende's sister Alice of Antioch, exiled from the Principality by Baldwin II, took control of Antioch once more after the death of her father. She allied with Pons of Tripoli and Joscelin II of Edessa to prevent Fulk from marching north in 1132; Fulk and Pons fought a brief battle before peace was made and Alice was exiled again. In Jerusalem as well, Fulk was resented by the second generation of Jerusalem Christians who had grown up there since the First Crusade (1095-1099). These "natives" focused on Melisende's cousin, the popular Hugh II of Le Puiset, count of Jaffa, who was devotedly loyal to the Queen. Fulk saw Hugh as a rival, and it did not help matters when Hugh's own stepson accused him of disloyalty. In 1134, to expose Hugh, Fulk accused him of infidelity with Melisende. Hugh rebelled in protest. Hugh secured himself to Jaffa, and allied himself with the Muslims of Ascalon. He defeated the army set against him by Fulk, but this situation could not hold. The Patriarch interceded in the conflict, perhaps at the behest of Melisende. Fulk agreed to peace and Hugh was exiled from the kingdom for three years, a lenient sentence. Fulk also strengthened the kingdom's southern border. His butler Paganus built the fortress of Kerak to the east of the Dead Sea, and to help give the kingdom access to the Red Sea, Fulk had Blanchegarde, Ibelin, and other forts built in the south-west to overpower the Egyptian fortress at Ascalon. This city was a base from which the Egyptian Fatimids launched frequent raids on the Kingdom of Jerusalem and Fulk sought to neutralize this threat. This 1143 date of Fulk�s hunting accident death was prior to the Second Crusade, which was 1147 � 1149. It�s interesting to know that a French-born ancestor in our family lines found occasions to gravitate into the Jerusalem area in military pursuit, and to become King of Jerusalem. His death there meant he never had connections back in his French homeland. Another interesting observation is to see Fulk�s genealogical descendants include three Kings whose fame is connected with their three generations of issuing 17 versions of governance known as the Magna Carta. They were John of Lackland, Henry III and Edward I (Longshanks), appearing in the 4th, 5th, and 6th generations later after Fulk. The descendants from Fulk shown in this 323-page report go down to the 32nd generation of my Westmoreland grandchildren.